1960s Fashion prior to the British invasion in 1964 was a continuation of the late 1950s. But with the Beatles came a new and very different fashion influence not Paris or Milan but “swinging” London. The brand new post war “babyboomer” generation was proving that it was a power to be reckoned with. 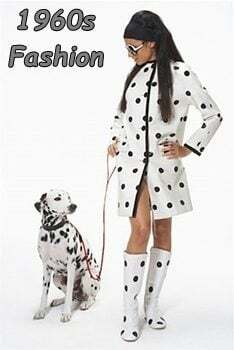 They had energy and sheer numbers on their side and they turned the designers away from catering to the old and wealthy to creating fashions specifically for young adults. As the phenomenon continued teens and even pre-teens were also included for the first time. Mary Quant out of her small boutique in London hit upon the winning combinations and created a fashion feeding frenzy starting with the mini skirt and crowning with major fashion houses the likes of Chanel and Dior following suit. Styles which were previously driven by the necessities of the middle class were now being designed for young people who constituted a newly empowered buyers market. One fashion trend was straight from the big design houses. Featuring bright colors, leg revealing lengths, geometric patterns and hyper tailored designs Mod Fashions were a must for the “in crowd”. Designers like Cardin, Emilio Pucci and Paco Rabanne jumped on this fashion trend to showcase their talents. Innovative, creative, bold and brash. 60s fashion belonged to London, England. The British set the tone and the world followed …. The other fashion trend was created by the social anarchists rebelling against the establishment as well as mainstream styles. 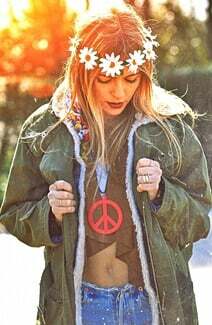 The Hippie movement favored relaxed, comfortable and natural clothing styles. The norm for most college age kids was bluejeans and a tee shirt (tie-dyed or not). They shunned commercialism yet spawned, in later years, one of the most sought after commercial looks. Much of the look depended on using what you had or could buy second hand. Hippies didn’t buy distressed jeans, they wore them until they were distressed, this was true for most of the hippie wardrobe …. 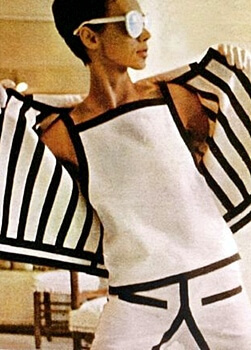 1960s Fashion – Models could make the difference in whether a designers’ line was successful or a flop. Certain designers favored particular models …. The second half of the Sixties begins quietly. But the dynamic social changes sweeping the world would soon manifest themselves in fashion. A new freedom in hemlines, a bolder approach to color would parallel the youth movement yearning for choices which did not mimic their predecessors …. Another very popular style of the 1960s which proved to be more enduring was the mini skirt. The mini was the most seen fashion modification of the decade. It was worn by everyone from the trendiest celebrities to office workers, to housewives. Along with the birth control pill nothing else empowered women as much. The mini embodied the growing woman’s movement portraying both their individuality and sexuality. Women were liberating themselves from the uncomfortable and matronly apparel of the fifties. Armed with synthetic materials, new female designers and ready to wear affordable designs the mini was ready to explode onto the 1960s market …. In the 1960s designers and advertisers were climbing all over each other trying to stand out in the crowd. Metal, vinyl and paper were used to get attention and to be different …. Metal and clear vinyl, this was not off the rack! Some things don’t change much. The basic black dress which is a staple of every woman’s wardrobe has remained a constant …. Evening Dresses were pretty and often sultry but tasteful. We dressed like ladies. We wore gloves, often the long over the elbow kind…. We called these hip huggers. Low slung and worn with a wide belt. They had a slimming effect which made them very popular …. What’s old is new. 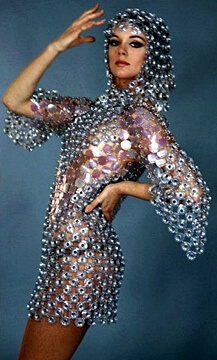 Many of these 1960s fashions are worn today. 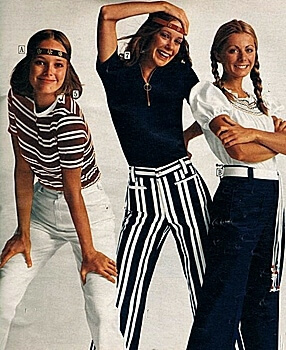 Capri pants are popular again, bell bottoms never went out of fashion and hippie clothes are a 1960s fashion must have…. Your shoes and handbag were expected to match your outfit. 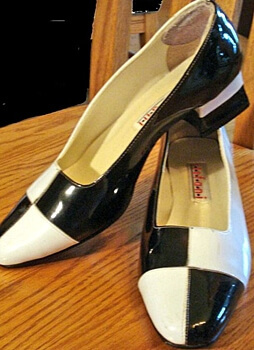 Many shoes had matching purses …. 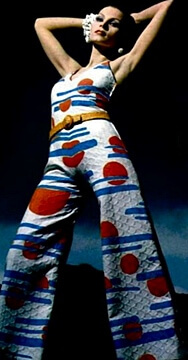 1960s Mens Fashion was not as revolutionary as it was for women but there was a lot of change. Men got more options, some in business attire as well as a whole lot of choices for casual dressing ….